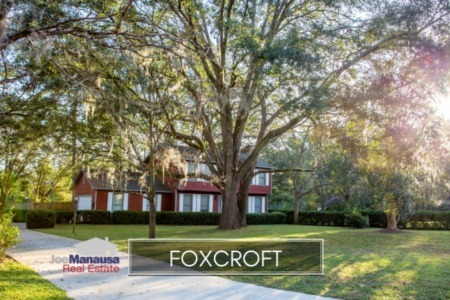 Foxcroft is a popular small Northeast Tallahassee neighborhood which happens to be coming off its best year for home sales since 2005. This year will be good too, but I suspect fewer homes will be available for buyers. 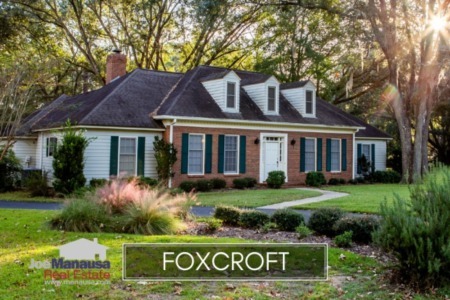 The reason for its popularity is that Foxcroft is located along the continually desired Thomasville Road corridor on the western edge of Killearn Estates. In fact, were there more homes for sale in Foxcroft, they would also sell this year. It is important to note that the narrative contained below is for sales through December for all previous years, but through the first two weeks of March in 2016. The graphs and the closed sales table will be continuously updated into the future (meaning bookmark this page if you always want to know the current status of homes in Foxcroft). Foxcroft home prices rose nearly 8% in 2015, as the average recorded sales price is $196,400. Thus far in 2016, two smaller homes have sold so this price is lower, but three of the four homes on the market are listed at prices above $200,000, so expect this to be far higher by year's end. As I have said in the past, when you can find a well-conditioned home in one of these Thomasville Road corridor neighborhoods (like Foxcroft) that is priced below $200,000, scoop it up! The 21 closed home sales in Foxcroft in 2015 were the most sold in a year since 2005 when 24 homes sold. This means that Foxcroft is doing better, in terms of unit sales, than most other Tallahassee neighborhoods in the housing market recovery. Foxcroft home values rose more than 9% in 2015, and they appear to be heading higher thus far in 2016. The first two sales this year averaged $113 per square foot, which is up another 7% over last year. This means that buyers have figured out how good values are right now in Foxcroft. They remain 18% lower than they were at the height of the housing market in 2006, but are up nearly 35% from the bottom of the market established in 2010. If you were one of the wise buyers in 2010, you have plenty of equity to trade-up if you would like. The 21 home sales in 2015 averaged 1,840 square feet, but the two sales this year have been much smaller, averaging on 1,578 square feet. This is likely why the values appear so much higher so quickly and will likely stabilize as the larger homes close in the coming weeks. The following list shows home sales in Foxcroft going back to 1991. I hope you enjoyed our March 2016 update on home sales in Foxcroft, please feel free to drop me a note if you have questions not covered in this report.